The BBC reports on the discovery of an ancient board game piece, unearthed during an excavation in England, that raises question about the role of board games in daily life. The latest news in the world of board games: Forbidden Desert, Mobile Suburbia, World's Oldest Board Game Pieces, Panic Station, Pure Chess, and more board game news and reviews. 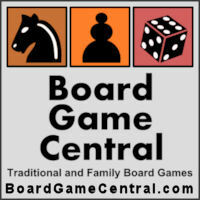 The latest news in the world of board games: Most Valuable Vintage Board Games, Mobile Suburbia, Monkeying Around with Spin Monkeys, Lessons From Monopoly, and more board game news and reviews. The latest news in the world of board games: Finding Ms. (or Mr.) Right at the Board Game Table, Yedo, Midwest Harness Racing game, Jupiter Deep, Ponder, and more board game news and reviews. The latest news in the world of board games: New Scrabble World Record, Reviews of Argh!, Quarantine, Ristorante Italia, Morels, and more board game news and reviews.